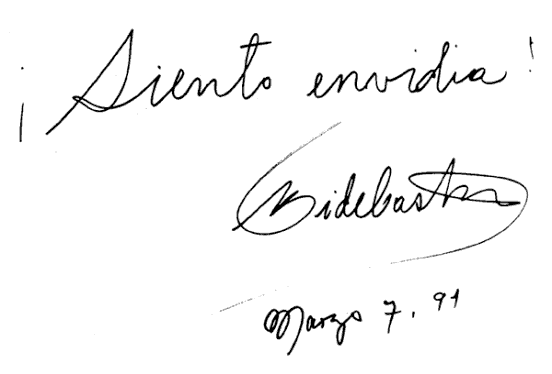 This 1991 note, in which Fidel Castro writes that he feels envy, hangs in a frame on the wall of the Youth Computer Club (YCC) headquarters in the one-time Sears building in Havana. Fidel dedicated the headquarters and supported the Youth Computer Clubs, where kids could play games, take classes and send domestic email. The YCCs are now in 611 locations around the island and have produced over 2.25 million course graduates (adults and kids). "I lived in Old Havana until 2001 – at the time, I was starting High School and recall that during my last year there my school managed to get their hands on a handful of desktop computers. Of course, internet connectivity was unheard of, but people were highly fascinated with the prospects of technology. Access to those computers was extremely restricted, even though one couldn’t do much with them (or knew what to do with them). The room they were in seemed more like a small fortress than a computer lab – doors were locked from the outside with heavy chains and windows blocked with metal bars (despite being on the third floor of the building). Fascinating times. Through a family friend I managed to land a basic “computer science” class at a center in Old Havana – the name of the institution escapes me, but I clearly recall it was one of those rare buildings with blasting air conditioning. That aspect alone was worth the 15-blocks walk from my apartment to the center. The class tried to teach the very basic functionalities of Windows – right & left clicks, creating a new folder, word documents, etc. I can’t say I learned much. On my side, it wasn’t until I arrived to the states that I truly learned to use a computer. Two years after my arrival (while still learning English), I was doing web development and running a local site centered around education and social gatherings. Two years later, I went off to the University of Chicago for Economics and continued to work on web ventures while there. To date I’ve worked on many web projects, mostly in the entertainment space and other more serious ones: hello.webicator.com (current project, under development). This service may be of interest to readers of this blog, LP. Today I work with a group of economists at a bank in New York, but follow the topic of internet penetration closely, not only in Cuba, but in Latin America as a whole. Data from the World Bank suggest that Latam is today where the US was at the end of the 1990s in terms of internet penetration. However, the pace of growth appears to be greater than it was in the US, which makes sense intuitively given that the technology already exists – now it only needs to become cheaper and for countries to obtain the infrastructure to sustain it. Cuba is sadly a very different story since politics plays such a large role. I suspect that the spread of internet, when it comes, could potentially lead to a shift in mentality – with a greater sense of awareness about life outside of Cuba, will arguably emerge a greater desire for change. When the day comes, I am sure tighter content filters will be implemented, but individuals will always find ways to circumvent them, as they do in China. Indeed a very sensitive topic." If you are or were a student in Cuba, was Alberto's experience similar to yours? We used to learn the programming language "Microsoft Basic" on those things. A few IBM-compatible 286 and 8086(XT) computers were installed at some point, but only with 5" floppy disks and without hard drive. I guess it was cheaper that way. MG, did you go to the Youth Computer Centers too? You are rigth about the cost of hard drives for old IBM PCs. The first PCs had floppy drives only, and add on drives -- in their own powered chassis -- cost about $5,000 for five megabytes. I did go there from time to time, the computers there used to be more advanced than those at schools, they used to have drive and all. I even took there a "programming" course in Logo when I was a child. Nowdays YCC are kind of abandoned... They are still offering courses but now they mostly have old computers and a lot of corruption. My history is a little bit different. I was diplomated architect in 1989. By the time of my studies Roberto Robaina was pushing very hard in order to create a net of Joven Clubs. He requested the support of the architecture school in order to make the projects. I was one of the students creating the 4 prototypes of buildings for this program. Robaina had a very interesting ideas. After the first phase he engaged itself in creating a big center to train the future teachers of those many centers. That was my diploma thesis. A building for about 400 computers to be built in N between 21 and 23 streets in Vedado, opposite to the Pabellón Cuba. It was a very ambitious project . As usual we did not have any economical background or business plan. All we have to reach was a "WOW" once the project would be presented to Robaina. So, we multiplicate the numbers of computer the University had and created the building. It was successful, Robaina was very enthusiastic with the idea. The next step would be Castro itself. The project should be presented to him in an exposition in the Pabellón Cuba. We as students were very nervous. When Fidel arrived we knew he was there, it always came with a lot of people around. He approached to the model, had a look at it while Robaina told him it was the next step in the program of the Joven Club. We should explain the project, but instead Fidel started to explain the project to us. He came across with some numbers, statements about the present and the future of the computers science. At the end he concluded that we needed to think big (regardless the project was twice as big as the University computing center). He called for the Construction Minister and told him: we need to create a center for the whole Latin America, for all poor children of the world, we will create a new University of Computing Sciences for the third World. The idea of the UCI was born in that very moment. And for our project, they sent me in a plane several months later to Camaguey in a plane to present it to the Young Communist Organization. They wanted to build it in Camaguey, but they did not have the support for it. I did not hear about the project anymore. I heard a different story about how the UCI was born. About the year 2000 the Russian government lent a military base to the Cuban government because the contract for the base expired and it was not renewed. During one of the "Informatica" events in Pabexpo (Havana) there was a conversation between Fidel Castro a few university professors that were there, and among them was the dean of the faculty of Mathematics and Computer Science of Havana University. She told Fidel Castro that it may be a good idea for the Cuban government to invest in development of the software industry (Alina was her name if I remember correctly). Fidel Castro needed to do something about the ex-russian military base because the US government could use it as excuse for an invasion, so he asked her a few questions about "this investment idea", and it was decided that the old military base was to be converted into a Computer Science university where they could also get contracts from companies and foreign governments and involve the students in the software development process. This is what I heard about how UCI started, and that woman was appointed by Fidel Castro as the Rector of the UCI once it was re-arranged (I think she was removed from that position some time ago). The decision of converting a military base into a Computer Science school brought rumours in Florida that Fidel Castro was trying to "assemble an army of hackers in order to lunch hacking attacks against US government servers", I have to confess that I burst out laughing the first time I heard that.